Do I want natural/synthetic/blended fibres.? Do I want my quilt thin/thick, flat/puffy? Do I want my quilt hand or machine quilted? How close will I be quilting ? Will I be using my quilt in summer or winter.? Will the quilt be washed a lot or is it just for display? Is the quilt for a bed or wall hanging? What kind of look do I want my quilt to have – antique/contemporary/smooth or puckered? Wadding falls into 3 main categories, synthetic, natural and the blends that is wool/polyester and cotton polyester blends. Within each category there is a wide variety of wadding available. When machine quilting it is advisable to use a wadding that does not shift when you are sewing. Cotton wadding and cotton polyester blends stick to the quilt top and backing and help prevent shifting. These waddings are suitable for beginners. Cotton wadding shrinks when washed, the shrinkage is generally at the same rate as the cotton fabric in the quilt. I find this beneficial as it gives your quilt an antique aged look. Cotton breathes and allows excess heat to escape so it is comfortable to sleep under. 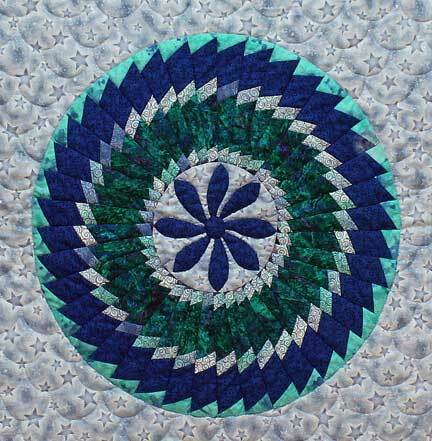 It washes well and becomes softer with age and use so is a good choice for a baby quilt. Cotton does not beard as do many of the polyesters, wools and wool blends. Lightweight polyesters are a good choice for beginners as they do not need quilting as closely as some of the cotton wadding. They are also excellent for quilts that need to be washed often. When quilted some polyesters give the quilt quite a high loft. Be aware that some polyesters may beard and are therefore best avoided when quilting a dark quilt. Avoid thick polyester waddings that are designed for craft purposes, they are too thick and stiff for both hand and machine quilting. Wool wadding is warm and lofty without being heavy. It has a good loft retention and is easy to machine quilt. Wool breathes and moderates the temperature, it also keeps the skin dry so you never get too hot or cold sleeping under it.